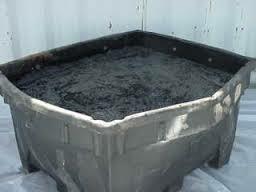 Over the years, we’ve seen just about every type of oil sludge imaginable. We don’t very often get “easy” stuff! Instead, we usually get the oil sludge that nothing else can touch. Blasting the sludge with other chemicals – The more chemicals you add to the sludge, the more difficult it is to wage chemical warfare and split the resulting water, oil and solids out from what’s left over. Mixing wastes – Remember the whole point is to reduce waste volumes. If you compound sludge with other waste streams, even if you’ve removed some of the oil, solids and water in the process, you still have to deal with that waste. Delaying the inevitable – Eventually someone will have to truly deal with the sludge, whether it’s you or someone else. Here are 2 examples of sludges we’ve received that are the prototypical “Tough Sludges” that were made even worse by waste management companies in their prior attempts to treat it. On one occasion we were sent some crude oil storage tank sludge from South Africa that had been pre-treated by a customer using a high dose of polymer via a chemically enhanced centrifugation technique. The polymer had been of limited success - some water had been recovered from the waste stream - but a very sloppy sludge was left with significant quantities of oil and some water still trapped within it. The high dose of polymer had bound itself so tightly within the waste that it was impossible to split again. The irony is that if the customer had used SAS-ES products first, they would have been able to treat their waste effectively with a single pass treatment process to recover oil, water and dry solids fractions. Another classic example was a sludge from South East Asia. It was a waste Oil Based Mud fraction that had been pre-treated to death via centrifugation methods. What was left was a tightly emulsified fluid packed full with ultrafine colloidal solids. To make a long story short, the previous treatment of the sludge made it much more difficult and expensive to treat the significant volume that remained. The great thing about SAS-ES products is that they add no volume and they are designed to separate the waste. This means that after treating with SAS-ES products, there is nothing additional in the oil or trapped within the solids. The SAS-ES chemicals for treating oil sludge partition into the water phase and since they are non-toxic and biodegradable, the water phase is cleaner and safe for wastewater treatment or disposal. So, the morale of the story is this... make your life easy and get SAS-ES in there first. You can simplify your whole process and you won’t be left with a nightmare sludge that’s going to cause you more and more problems later on.